You are here: Home › Garden design › What is hard landscaping in the garden for? What is hard landscaping in the garden for? • Comments Off on What is hard landscaping in the garden for? November can be a dank and drear month not very conducive to pottering in the garden but it is a good time to evaluate the overall layout of your garden, free from the fluff of foliage and flowers. A key element of the layout of a garden is hard landscaping so this month’s ‘garden ponder’ is What is hard landscaping for? And by hard landscaping I mean the built parts of the garden: paths, patios, walls, fences and the like. So at the very basic level the answer is a dry path to reach the shed and level, flat surfaces to sit on. But hard landscaping has another role. In all but the largest gardens the size, shape and materials used underpin the style of the garden. In this photograph we see straight lines, square shapes and a contemporary mix of textures for the walls, paths and the water feature. The planting is soft and flowery but overall the effect is crisp and modern. By contrast if you created flowing shapes and a meandering path using reclaimed bricks and rustic timber then you would be well on the way to a cottage garden even before adding the plants. So when you are looking at your garden and deciding if it is an attractive space all through the autumn and winter as well as in the height of summer, give thought to the overall layout and specifically to the hard landscaping. And ask yourself whether the size, shape and materials of the walls, fences, paths and patios really support and promote the style of garden that you want. 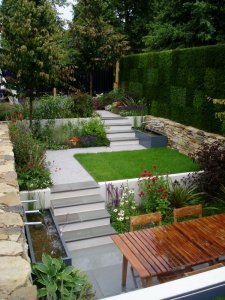 It may not be realistic to totally replace your entire garden but if you have a rectangular lawn with a straight path down one side and you are aiming for a naturalistic, cottagey effect then you are always going to be fighting against the stark lines of the hard landscaping. Maybe curving the path across the end of the garden to create a rounded lawn or adding generous sweeps (not mean wiggles) to the border would be possible so that by next spring your house is all ready to become a cottage nestled into your natural, flowery space? If you like this blog post, please follow me on Facebook or Twitter for more hints and musings or join my mailing list for in depth articles and video tips.